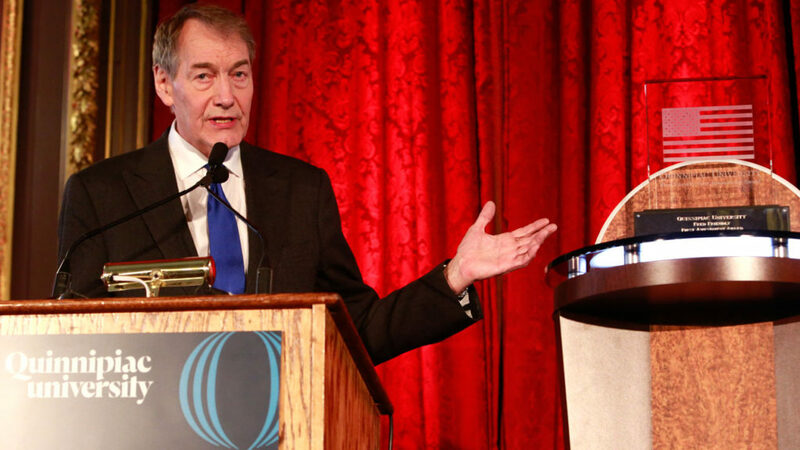 Quinnipiac University honored Charlie Rose, anchor/executive editor of the PBS programs “Charlie Rose” and “Charlie Rose: This Week,” and co-host of “CBS This Morning,” on June 15 at its 23rd annual Fred Friendly First Amendment Award luncheon at the Metropolitan Club in New York City. Rose has perfected the art of the interview. Since 1994, Quinnipiac has presented the Fred Friendly First Amendment Award to honor those who have shown courage and forthrightness in preserving the rights set forth in the First Amendment. The award bears the name of the former CBS News president and champion of freedom of speech. Previous recipients of the Fred Friendly First Amendment Award are: Dan Rather, Bill Moyers, Lesley Stahl, Ted Koppel, Tom Brokaw, Robert MacNeil, Jim Lehrer, Don Hewitt, Peter Jennings, Mike Wallace, Christiane Amanpour, Tom Bettag, Tim Russert, Bob Schieffer, Steve Kroft, Charles Gibson, Morley Safer, Gwen Ifill, David Fanning, Martha Raddatz, Scott Pelley and Richard Engel.